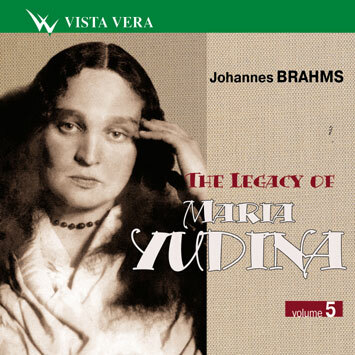 Maria Yudina always esteemed Johannes Brahms as a composer and thought highly of his personality. She found him a person "of great intelligence and high moral integrity". Yudina heard in his works some eternal themes, which no true artist could escape. These were love and desperation, the pursuit of one's lot, the endevaour to solve the causes of the sorrows of the world. But she also saw the joy and light running through many of his works. What admired her was how "this amazing man of genius was satiated with life in all its manifestations". A unique recording of Brahms' Variations on A Theme by Handel was made in 1948, more than half a century ago. It is one of Yudina's earliest recordings. Her style of performance amazes by the grandiosity and thoroughness of the conception and some transcendental virtuosity that combines true liberty, easiness and incredible colourfulness. Her imagination is truly boundless. While drawing out of inexhaustible source of the Brahms' ingenuity she strews before us like precious stones 25 variations of very different character. Yudina knew the joy of a joint creative work. More than anything else she liked the moments of making music together with other musicians when "the art of music runs through everybody and everybody is happy to be in it together with others". She inspired her students and partners - musicians with this joy involving them into free artistic explorations. The Beethoven Quartet was one of Yudina's objects of affection. She played with the outstanding musicians of the Quartet ever since 1930. They are truly unique, she used to say. Though, as she admitted, there were moments of rather deep difference of opinion between them it never destroyed their mutual respect and friendship. The main thing was that they together made superb interpretations of many chamber compositions. Brahms' Piano Quartet No. 2 was one of those compositions. This is one of the last recordings by Yudina made on November 14, 1969. Earlier Yudina played it on March 18, 1969 at the concert of the Beethoven Quartet at the Maly Concert Hall of the Moscow Conservatoire and it was her last public performance. Life full of severity, hardships and sorrows was fatally coming to the end. Maria Veniaminovna compared it with the shagreen leather. Yet in the Quartet's performance we will find no even a hint at weariness, disillusionment, or despair. On the contrary, it breathes with a joyful sensation, a clear and sometimes naive perception of life. And the final movement carries us away by the elements of a folk dance that sounds so youthful and exciting. This interpretation fully conveys Yudina's vision of the composition: "The theme of the Quartet is happiness; it is the aspiration of human being for happiness, it is beatitude".